Sometimes we all, like Tennessee Williams, depend on the kindness of strangers – whether we realize it or not. While I’ve always shared my family research and stories, it has been only recently that I’ve come to understand how initiative, serendipity, and luck work together. Four families – all my cousins – have lived in My Old House for the last 227 years, fine New England families who undoubtedly followed the old axiom “Use it up, wear it out, make it do, or do without.” It’s understandable then that there are few things left from the early days, but surprising all the same that there are so few photographs of this house when I am wealthy with photos of my great-great-great-great-grandfather George Read’s house, right next door. 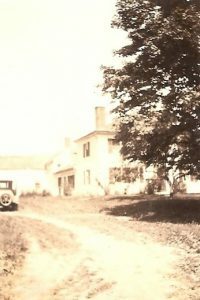 For decades I had been unable to find any photos of my Asa Williams House prior to 1944. Even the WPA’s 1938 tax photos were unavailable. What I was able to find were mostly after the mid-1950s. Locating descendants who might have such photos is always difficult considering privacy issues and the fact that those I might ask have passed on. Enter the strangers. While working with a Washington State researcher on my Cony/Cummings family lines, I came across a public family tree on Ancestry.com which included the families of the Asa Williams House. I sent off a blind email to the family tree owner asking for clarification of a family name, and oh! by the way . . .
An answer came within a couple of days which began an exchange with Andy and his father Jerry, distant cousins who so very kindly provided me with two photos taken about 1912 and 1926, judging from the group of ladies and the car in the yard. They were the gold of my year, a gift for which I cannot give enough thanks. But serendipity wasn’t done with me. A few years later (yes, years), I received an unexpected call from a complete stranger. Shirley, who was Jerry’s first cousin, called asking to visit me at my house. She explained that when she was five years old she had lived in My Old House with her grandmother, Lora Packard Saunders, the same cousin who had deeded this house to my parents. Jerry had given my contact information to Shirley, who hoped to once again see the house before its sale. 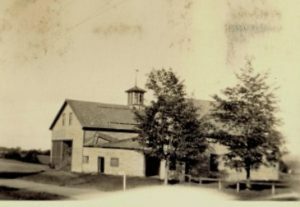 During her visit, she produced a magnificent family history scrapbook she had compiled as part of her research, and then allowed me to scan a few photos of the house, the original barn, and some of our mutual relatives seated with some of my paternal relatives, none of which I’d ever seen. Shirley and I are still in touch, she helping me to correct and verify my data, while I help her to clarify our somewhat convoluted common lineage. Deciding whether the strangers or the serendipity came first is a little like asking whether the chicken came before the egg. I don’t think it matters: roast the chicken and fry the egg! Give serendipity a fighting chance. Unasked questions garner no answers, no connections, and no results. With a little lateral thinking, a lot of luck, a bit of synchronicity, and some undeniable serendipity, I have gained connections to some generous people, and through their kindness I’ve received some materials I had sought for decades. Great story, Jan. I agree: it never hurts to ask. The worst they can do is ignore you. Love this! I am very glad my father took pictures of our homes when we were growing up as one of them is now gone. 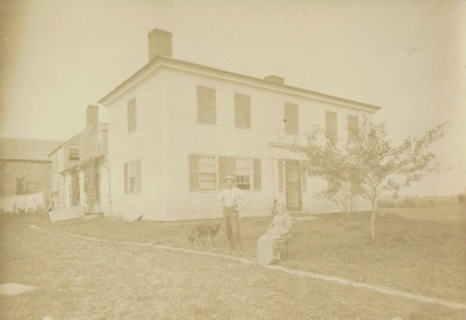 Via my research on a 3x great-grandfather, I made a connection with a woman who LIVES in his home today in the Philadelphia area. 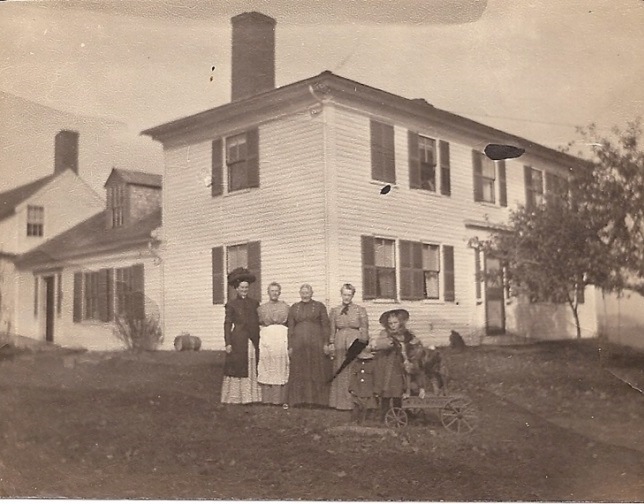 I live far away from there but she sent me pictures of the house – then and now – and said I would be welcome to visit! She was doing research on the history of the house. Wonderful, the kindness of strangers!! I was similarly blessed. I had been doing ancestry research for years learning about my Bright family line which I had taken back to Elcana Bright born in 1762 in Delaware. He later took his family to Virginia, which became West Virginia. His eldest son was William Thomas Bright and I was trying to find out where they and Elcana’s wife, Elizabeth “Lizzie” Thomas Bright had been buried. One day out of the blue, a lady contacted me through Ancestry.com and said she had a photo which her mother had taken and she had remembered the place and event. It had been taken in the 1940s and showed her pointing to the headstone with the name William Bright and birth and death dates. The lady had checked on Ancestry to find a match and contacted me! She gave me the location of this small family graveyard which she remembered also had a stone for a Lizzie Bright! Sadly, that cemetery no longer exists and is covered by a shopping mall. The stones, by law, should have been removed to the county yard, but a cousin who tried to locate them had no luck..so ONLY through the blessings of THIS kind stranger could we have ever known the place where our family had buried their members..and in this photo when enlarged one can clearly read the name and dates. Thanks and blessings on Margaret Alice Kundrock and her sister, Dotty Kundrock Kasmann! Very interested in this as Elcana Bright is also my ancestor by way of Retilla Bright Everly. I would like to know more about this family. My 8 sisters and I are planning a family trek to Maine. I have been researching information about our families. One of them is Packard (my mother’s maiden name). I would love to have contact with Lora Packard Saunders for more information. Thanks for your information. Hi Dee, Lora Packard Saunders passed away in 1965, the only one remaining of her siblings; the last of her children died in 2000. Unfortunately, I have no information about any surviving Packard family members in this area. Any chance you have identification of the people in the house photos?